The weather was perfect this weekend. Highs in the 70's and not a cloud in the sky. We spent a good portion of it outside. It was the perfect mix of relaxation and productivity. If that is even possible. 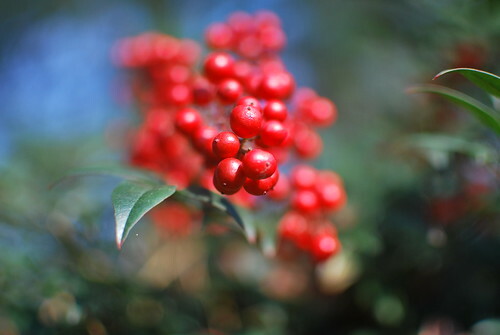 There is something about these berries that drawn me in every year. Maybe it is the bold red color against the rest of the drab colors. Maybe it reminds me that the holidays are near. Whatever the reason, I can't seem to get enough of them. ...or the intoxicating bokeh. I'm not sure but I think it is a little of all of it that makes me smile. that second one looks like it's jumping out of the photo -- wow! Very nice shot - love the bokeh! It looks like I could reach up and grab a berry off that second shot. Very good! Oh yes. Definitely that bold bright red. So lovely. I love that red... so hard to find the perfect one... this red is great. Well done. Beautiful shots! 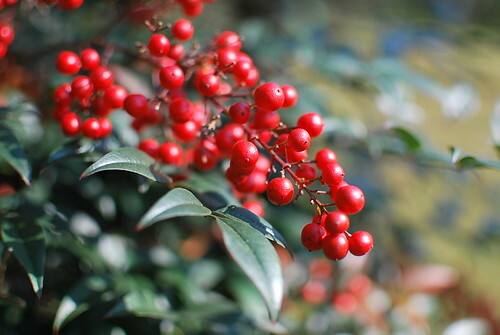 Oh, I love the red berries, too. I have my own tree full of them and love those pictures. Wonderful color. It totally pops on each shot. Love the colors. Funny thing I was talking shots of the same berry's this weekend for the same reason. I like you shots better. BTW- I was using my coffee cozy the other day and got a compliment on it.